This quilt block could not be easier to construct. It is made of only squares and rectangles. The trick is how to place the fabrics in the block to get the woven effect. 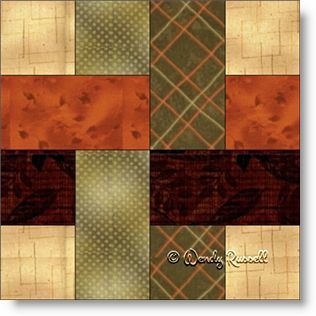 Believe it or not, there are umteen ways to lay out this block into your quilt to come up with all sorts of interesting designs. So, don't assume that an easy quilt block equates to boring. One of the sample quilts illustrated gives a look of "plaid" (always one of my favourites) and for the other, I chose to add a "picket fence" look to the edges of the quilt in the form of a pieced border. Normally, I do not include instructions for borders of the sample quilts, (as that is just too time consuming), but this one intrigued me. So, I have also added the details of how to construct the pieced border -- which includes one of my favourite patches (and an underused one at that), a patch that quilters call a three quarter square triangle. Enjoy!